Introducing our award-winning Angle Classroom on Wheels. This is the answer for Early Learning Centres who lack space, especially those in poor townships. The Reading Corner, our innovative mobile, foldable furniture system, solves this problem by taking up very little space when stored or when in use. Perhaps the most obvious and the most popular teaching aids are the puppet theatre, which encourge communication skills and can be used by the educators and the learners. A lack of space is a harsh reality that countless needy Early learning Centres in South Africa have to deal with every day. The Angel Classroom on Wheels is our solution to these difficult circumstances. 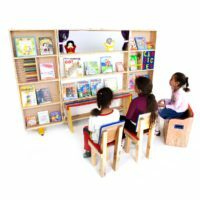 The learning system is a mobile fold-up furniture system that takes up less than a foot of space when in a stored position. It literally opens up to reveal a world of experiences and information through the books within its confines and comes with Educational Toys installed in the shelves. It also has secret fold-up benches inside, the face is a chalkboard and the upper section is a puppet show display. The whole thing is mobile with a wheel lock function and takes up less than a foot of buy viagra online legally space when in a stored position. The Angel Classroom on Wheels was declared one of the winners in the Swarm Vision Global Innovator’s “The Future of Education” campaign. The competition, held in Silicon Valley, California, called for entries to design pre-school spaces, tools and equipment that re-define early childhood education as well as school furniture and equipment, more suited for creative thought and play. More than 346 entries were received, many of them from experts in the design and educational sectors. The Angel Book Nook won in two categories: Best Idea and Best Visual. 2014 winner of Spark Changemakers of the Year. We want to help needy children in Townships enjoy a better learning experience by providing a serene and tranquil space for them to foster a love for reading and learning at an early age. If your organisation would like to donate an Angel Classroom on Wheels to a struggling Children’s School or Early Learning Centre, please reach out. $350 is all it takes to create a job whilst giving a child a better reading experience.